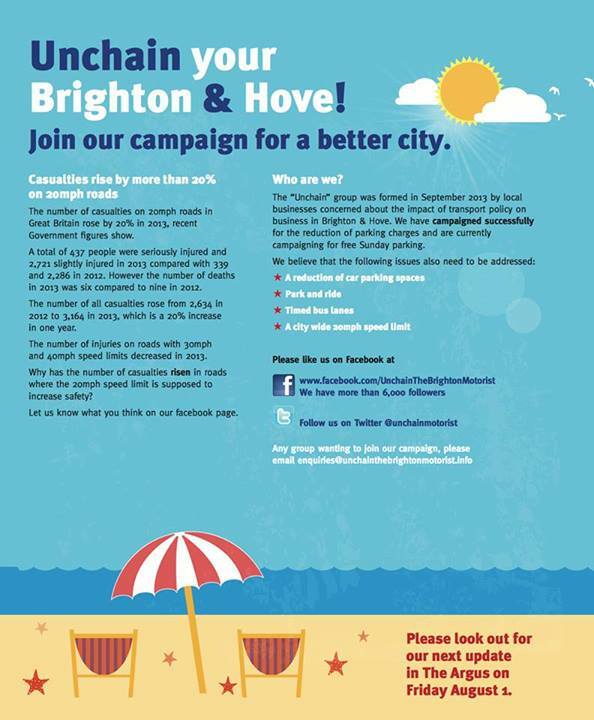 A new advertisement from the Brighton fringe group Unchain the Motorist, which claims to speak for drivers in Brighton and Hove, makes a hugely misleading assertion about 20mph zones and casualties. The advertisement quotes DfT statistics showing that the number of casualties in 20mph zones has increased substantially for 2013, while those on 30mph roads fell, and challenges readers to offer an explanation. The point – and it’s one that is so obvious it just beggars belief that it has to be made – is that the length of road in 20mph schemes has increased substantially during that period, with towns and cities across England adopting lower limits. The information that we need concerns accident rates, but unfortunately the DfT does not collate a definitive figure for road lengths at 20mph so cannot publish a definitve set of statistics on rates. What one can do, however, is draw on research that has been done into the effect of 20mph zones. Every zone is different but research collated by Road Safety GB for 10 schemes shows substantial reductions in five, inconclusive but downward-trending numbers in four, and a small increase in one. The causes of casualty reductions are notoriously difficult to assess but it is clear that the hard evidence shows that it is wholly reasonable to expect a reduction in casualties – and in particular those affecting vulnerable road users like child pedestrians – where 20mph zones are properly implemented. Those familiar with the history of Unchain the Motorist will know that the integrity of their information is deeply suspect. The Advertising Standards Authority handed down a devastating judgement about the accuracy of an earlier advertisement: official bodies do not thumb their nose and shout “Pants on Fire!” but the language of that judgement is about as close as they ever get to it. Unchain the Motorist as an organisation seems to have a deep fear of evidence, complexity and nuanced argument – it would be easier to respect them if they were not such apparent strangers to intellectual honesty. Here in Brighton and Hove, the arguments about 20mph are over – a casualty of the cackhanded politics of an inept Green administration who managed only to generate hostility where other authorities have worked with communities to develop consensus and agreement. Unchain the Motorist is, in part, a consequence of that political failure. But making streets safer for vulnerable road users remains an important part of any inclusion agenda – and it is important that the politics of Unchain the Motorist are seen for where they sit in the broader political spectrum. And you really would have thought that they would have learned something from the humiliation meted out to them by the Advertising Standards Authority. This entry was posted in Brighton and Hove, Green, Transport Policy and tagged 20mph, 20mph speed limit, Brighton and Hove, Brighton and Hove City Council, road safety, Unchain the Motorist. Bookmark the permalink.